This is a famous Sicillian summer dish and a great use for aubergines when they are in season and plentiful (June - September). I like to make it with small aubergines whenever you can find them. That way you can avoid having to salt the aubergines to remove the bitter juice. If you are using small aubergines the sauce should take no longer than about 25 minutes. If using larger aubergines you will probably need to salt them and leave for up to an hour. Can I use any alternatives if I can't find certain ingredients? You could use parmasan or pecorino if you can't find the salty ricotta. 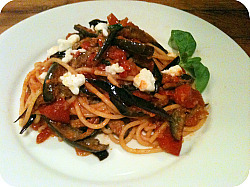 A similar recipe to this using courgettes instead of aubergines can be found here. The aubergines should be sliced length ways in slices then cut into thin strips. If using large aubergines, salt before cutting into strips and leave to drain. Make a tomato sauce according to the recipe here (try to use hairloom tomatoes instead of cherry tomatoes if you can). Meanwhile heat a pan of salted water for the pasta and add the spaghetti when the water starts to boil. While the tomato sauce is cooking fry the slices of aubergine in a pan with olive oil and season with salt and pepper. Once the aubergine slices are cooked add to the tomato sauce and heat through. Drain the pasta once it is al dente and add to the pan with the aubergine and tomato sauce. Reserve some of the water used to cook the pasta. Mix and coat the pasta with the aubergine and tomato sauce in the pan and if the sauce needs it, add a little of the reserved cooking water. Finally add chopped basil and some crumbs / shavings of the ricotta before serving. What are the origins of this dish? The sauce is Sicillian and its name is believed to come from Vincenzo Bellini's "Norma".